What Sarah Did Next: Yes, Virginia...miracles DO happen. If you have a child between the ages of 3 - 13, then you'll know where these outlandish looking creatures are from. Skylanders is a video game that was released late last year and has since gone gangbusters in the popularity stakes all over the world. The family-friendly game gets you to explore different lands, collect treasures and solve puzzles. All really cool stuff that kids just love. Players take on the role of the impressively titled 'Portal Master' (who dreams up these names!) who can control heaps of different characters. Each character has its own little plastic figurine that you place on the accompanying Portal to bring it into the game. But here's the stroke of genius by the game manufacturers - the starter pack comes with just three characters to get your collection going, leaving you with the 'option' (like there's a choice!) of purchasing the remaining characters individually.... ALL 30+ of them. It's brilliant marketing at its finest. And equals pure frustration for parents! Because in this house, Son #3 is caught, hook, line and sinker. As a child with autism, Son #3 has a tendency to become quite fixated on things. Especially things he LIKES. The extensive range of Lego Hero Factory toys currently arranged in a particular order on my lounge room coffee table stands as clear testament to this fact. In his mind, when you like something you have to collect it ALL so the collection is complete, otherwise what's the point? Which brings me to why I posted this today. He was given the Skylanders game for Christmas last year among other things, as well as some money. Naturally he thought he'd buy some more figurines to boost his collection but they have been about as rare as hens teeth. Or sunshine in Sydney. We could not find any for love or money and it wasn't for the lack of trying. I've looked everywhere! I even saw one shop that had a rather terse handwritten note pinned to the register saying "NO, we do NOT have any Skylanders!! We do not know when they are coming in!" The underlying subtext being "So back off! Don't ask! FFS! We're sick of talking about them!" No word of a lie. I was starting to get a little desperate. But today, halle-frikking-leujah, we had ourselves a little miracle. To my eternal undying gratitude, a good friend of mine (thanks Mrs A!!!) 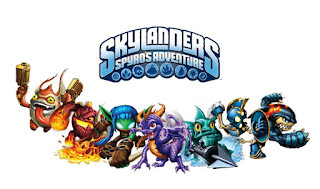 phoned this morning to tell me that she'd seen new Skylanders stock in a local Big W. She'd already grabbed a whole heap of them for me and would I like to meet her down there before they all disappeared off the shelves? Is the Pope Catholic? Hell yes, I sure would. Thank Goodness that they have finally arrived - No3 son will be VERY happy. Of course that is not the end of the story - you will have to keep an eye out for the remaining 20 figurines - even if you get them occasionally - as bribes, pocket money replacements or rewards. If you had've been here yesterday afternoon, you would have been witness to the happiest boy on the planet! His grin could not have been wider. I've got my name on a list at the shop for when the next lot arrive - so hopefully will get some for his birthday later in the year. Hello Fi! All set for the markets this weekend? I just couldn't take the crestfallen expression on his face every time we asked at the shop "Do you have any Skylanders?" and they said "No". Broke my heart. Poor kid was desperate to spend his Christmas money!